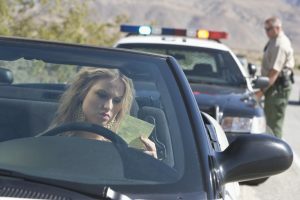 There are many different types of citations and levels of crimes within the scope of traffic tickets. Understanding the differences and when each type is issued can help you understand why your fine is what is, and why you are or are not required to go to court. Most traffic violations fall under the area of strict liability. This means that all that is needed to convict a person of a crime is proof that the crime was committed. Criminal intent is not required in order to convict a person in these cases. Violations in this area can include speeding, not signaling or yielding, faulty headlights, parking in a handicap spot, or overdue parking meters. Within the area of strict liability, traffic violations are further broken down into two sub-categories. Moving violations, as the name implies, are issued when a car is in motion while breaking a law. The most common of these is speeding, though it can also include everything from running a stop sign to a DUI. Non-moving violations are issued when the car is not in motion, or when the motion of the car is not part of the violation. These include broken tail lights or headlights, other faulty equipment, or parking violations. Moving violations are more severe and can include crimes that are classified as misdemeanors or felonies. Any situation where a driver caused or threatened to cause harm to a person or property can be classified as a misdemeanor or felony. Reckless driving and impaired driving are usually the most severe moving violations, and can lead to substantial fines and even jail time. Non-moving violations are considered infractions, which are much less severe than moving violations. Infractions are not considered a crime, and the only penalty is a fine, which is usually small. No trial is required, and if you feel the need to contest the citation, you can often do so by mail rather than going to court. The severity of the citation often determines the amount of effort and assistance a driver will need to successfully defend themselves against a citation. While not usually necessary for a parking ticket, the assistance of a traffic lawyer is usually helpful in fighting moving violations, particularly those that fall within the misdemeanor or felony categories.